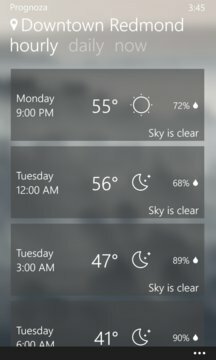 Prognoza is the Windows Phone Weather app you need! 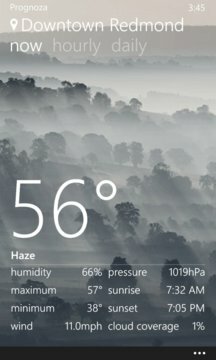 It suits for downloading the latest weather data for a specific City or your current location based on the Windows Phone location. The background pictures display the current weather conditions while the app shows lots of detailed weather data. Prognoza has a triel mode which gives you the full app experience for 7 days, in this period you can see if the weather is accurate enough for you, or if the app works fine for you, after this period you can buy it. The app can be used even after the trial ends, it has then just a few limitations like the live tiles and lockscreen will stop to update until it's paid. • A clean, nice design aligned at the Windows Phone design principles. • Live Tiles, front and back side with pictures of the current weather conditions. • A beautiful Lock Screen that updates along with the Live Tiles. • Wind rose for detailed wind directions and wind speed (just tap anywhere on the wind description inside tha app to open it). • Custom lock screen picture support! • Two sets of icons available to show on live tiles/lock screen. • Detailed daily and hourly reports. Just tap on an particular day/hour to see more info. • Weather sharing function to share the current weather with your friends across all WP8.1 apps that have the ability to share content. Try it out tap “…” (menu) > share weather > share with any available app and use the #Prognoza hashtag so we can share your weather further!